WASHINGTON— The data and digital director for President Donald Trump’s campaign said Friday he will speak with the House Intelligence Committee later this month as part of its Russia probe. Schiff said Wednesday that his panel wants to look at the use of Russian social media “trolls” and whether they were connected to the Trump election campaign. That concern is “certainly something we want to explore,” along with the Trump campaign’s data analytics, Schiff said. Parscale is a key figure in that part of the probe. The Trump campaign paid Parscale’s San Antonio, Texas-based firm more than $90 million to advertise on social media, analyze voter data and perform other campaign functions. 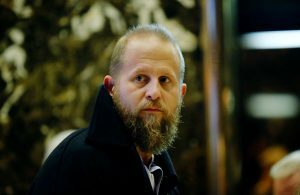 Parscale also used data to raise money online for Trump’s campaign and choose where to advertise on television and radio. Parscale is likely to walk lawmakers through how campaigns acquire and use data, which can help a politician understand and appeal to specific voters, as well as raise money from ardent supporters. In the general election, the Trump campaign relied upon a database of voters that the Republican National Committee spent years and tens of millions of dollars compiling. The campaign also contracted with Cambridge Analytica, a data firm that had previously worked with Sen. Ted Cruz’s presidential effort. The firm is backed by billionaire donor Robert Mercer and has drawn the attention of lawmakers over its claims of using “psychographic” information— that is, detailed analyses of people’s likes and dislikes based on their online activities. Trump campaign officials have downplayed Cambridge’s role, saying they briefly used the company for television advertising and paid some of Cambridge’s most skilled data employees. The campaign also paid dozens of data and digital specialists who worked out of the San Antonio office of Giles-Parscale. Major technology companies including Facebook, Twitter and Google detailed employees to work “side-by-side” with the campaign operatives, Parscale said. Companies often assign representatives to major advertisers, and those three offered the same services to Clinton’s campaign. Facebook said in a statement the company has been in touch with several lawmakers who are interested in how the site works and how Russia might have used it. Facebook said it has seen no evidence of Russian entities buying ads related to the presidential campaign on its site. Sen. Mark Warner, the top Democrat on the Senate Intelligence Committee, visited Facebook’s California headquarters earlier this year. Left: Trump campaign Digital Director Brad Parscale arrives in November at the Trump Tower for meetings with then-president-elect Donald Trump. Parscale will speak with the House Intelligence Committee later this month as part of its Russia probe. Photo by EDUARDO MUNOZ ALVAREZ/AFP/Getty Images.